Our latest review on biodegradable polymers. Biodegradable polymers like poly(lactic acid) are seen as a suitable alternative to commodity plastics in order to minimize the impact of plastics on the environment after disposal. However, poly(lactic acid) is basically non‐degradable in seawater. Similarly, the degradation rate of other biodegradable polymers also crucially depends on the environments they end up in, such as soil or marine water, or when used in biomedical devices. In our recently published review in Angewandte Chemie international edition, we show that biodegradation tests carried out in artificial environments lack transferability to real conditions and, therefore, highlight the necessity of environmentally authentic and relevant field‐testing conditions. 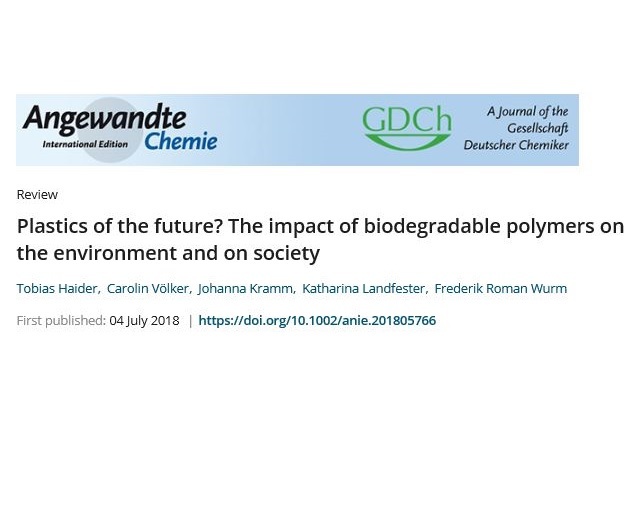 In addition, we focus on ecotoxicological implications of biodegradable polymers: Are there any possible adverse effects on biota caused by degradation products of the polymers? We also consider the social aspects and ask how biodegradable polymers influence consumer behavior and municipal waste management. Taken together, this study is intended as a contribution towards evaluating the potential of biodegradable polymers as alternative materials to commodity plastics. Check out our review here! How much packaging do we need?